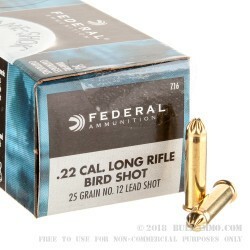 For safe close-range elimination of snakes, rats, squirrels, birds, and other small pests, try this Federal Game-Shok .22 LR ammo firing #12 birdshot. These shells are a low power load that will kill varmints without posing a major danger of ricochet. 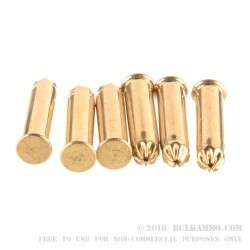 With a diameter of .05 inches (or 1.27 millimeters), the pellets pose a minimal risk of overpenetration and can be fired in situations where any other ammunition would be unsafe to use. 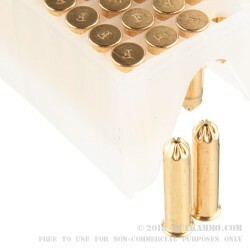 Each cartridge in this "brick" of 500 fires a 25-grain payload of #12 birdshot at a muzzle velocity of 1,000 feet per second. Due to the nature of the projectiles, this ammo is not suitable for use in suppressed firearms and should not be fired through a suppressor under any circumstances! 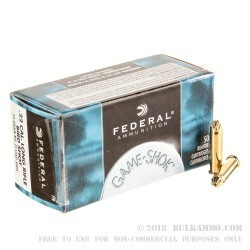 As the name suggests, Federal Game-Shok ammo is intended for hunting. It is loaded in Anoka, Minnesota by Federal Premium Ammunition, a division of the Vista Outdoor group. Q: What would be an effective distance for this load? I see it says close range so are we talking 10-20 yards? Or less than that? A: I would say no more than 5-10 yards from a pistol, a 16 inch or so barrel could probably yield the 10-20 yard ranges.